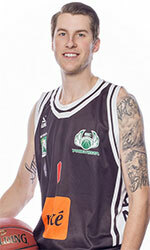 Grant Sitton (6'9''-G/F-93, played in 2012-14, plays pro in Holland) could not help Groningen (1-2) in their last game. Despite his very good performance the third-placed Groningen (1-2) lost 67-73 at home to the leading Openjobmetis VA in the group K of FIBA Europe Cup. Sitton was the top scorer with 18 points. He also added 2 blocks in 24 minutes; quite an impressive performance considering it's only Sitton's second season in pro basketball. It was Groningen's first loss after three consecutive victories. There are only three games left until the end of the FIBA Europe Cup Second Stage. So now every game will be critical. This year Sitton averages 9.1ppg and 2.3rpg in nine games he played so far. Chehales Tapscott (6'5''-F-90, played in 2008-10, plays in Japan) led Kumamoto Volters to a 1-point victory over the sixth-ranked Kagawa FA (7-23) 73-72 in the Japanese B2 League last Monday. Tapscott was MVP of the game. He recorded a double-double by scoring 19 points and getting 11 rebounds. Kumamoto Volters (22-9) are placed second in West group. There are only two games left until the end of the Regular Season. So now every game is very crucial. Tapscott has individually a very good season with high stats. He averages 21.1ppg, 8.7rpg, 4.4apg and 1.4spg.